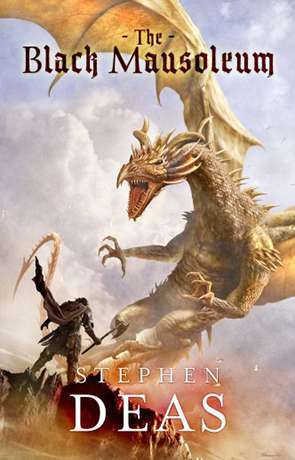 The fourth of Stephen Deas’ series, published in 2012, The Black Mausoleum picks up the story of Deas’ Dragon Realms sometime after the events of book three, The Order of the Scales. This is a wise choice as the epic conclusion to the first trilogy of books left such a scattering of story pieces it would have been a massive task to rebuild them and resurrect the epic scale. Instead, Deas shifts and narrows his focus, delving into the underground and turning to the lives of the lowly. The Black Mausoleum lives up to its name in this regard. The book is ‘grimdark’, the world now turned post-apocalyptic. The difference being to most stories of the same, we have witnessed the apocalypse along with these characters. In fact, the story parallels my own take on the same with the Wisimir series, particularly the second book The Dragon of Wisimir. In The Black Mausoleum, Kataros the alchemist, who was a supporting character from The Order of the Scales graduates to principle, proving to be much more interesting than we first thought. Together with Siff the itinerant outsider criminal and Skjeorl the Adamantine Man, she embarks on a quest to rediscover ancient magic that might help humanity survive against the dragons. The close attendance on the adventure of this group and some of those they encounter is a wise choice as it allows Deas to explore the consequences of the previous trilogy. Each chapter is a flashback or flash forward in relation to the next and carefully noted as to where it appears in the chronology of events. This serves to gradually reveal the circumstances that led to each character being in the situation they are in. This is particularly useful for our tracking of Kataros from her last scenes in the previous book. However, once the three are together, there are some problems in detail. The lack of food for the main characters is established with some gravity at the start, but then fitfully followed up. The debilitation of Siff, who is dying of starvation when we first meet him is part of this problem as his condition fluctuates, irrespective of sustenance. We learn later that there are reasons for this, but perhaps these reasons do not reveal themselves soon enough. Similarly, in this book, Deas’ Dragon Realms landscape is much travelled by his characters. The scenes themselves are well pictured and the comparative ruin is well documented, but the amount of places and time-hopping make the settings difficult to distinguish, particularly when they are places we knew from before in the previous books, only now wrecked. This is something of a shame at times because the descriptive writing is excellent, it is the artifice of the back and forth that has undermined it a little. Additionally, there are assertions of surprise when characters see ‘Dragon verses Dragon’ fighting. The previous battle in The Order of the Scales was so incredibly epic and inspiring, when the characters in The Black Mausoleum place limits on the reader’s image of that it is disappointing. With all this said, The Black Mausoleum is an excellent story and the shift towards gritty characters with less lofty goals is a successful decision. There is clear development of the world, Deas’ writing and the overall story when compared to the first novel, The Adamantine Palace. This fourth instalment feels more complete within itself too and by offering a less epic foray into his fantasy, Deas increases the longevity of his series. Story morsels like this are both satisfying and repeatable as the macro plot is, for the most part, held at a distance, but is still affected and changed by the events depicted here. There is certainly much more to explore in this series. Written on 2nd October 2015 by Allen Stroud.